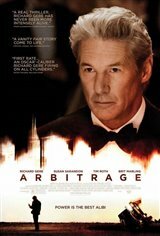 Family man and hedge fund magnate Robert Miller (Richard Gere) finds himself in over his head. As one of the most successful businessmen in New York City, he tries to maintain a picture-perfect facade as his Wall Street empire begins to crumble. Robert's wife Ellen (Susan Sarandon) and daughter Brooke (Brit Marling) have no idea what kind of mess Robert has gotten them into and are oblivious to the fact that their lives could be greatly affected if it all blows up. If Robert can finalize the bank purchase of his trading empire before any evidence of his shady dealings are leaked, he can save himself, his family and his reputation. But as his plan start to fall apart, he is left with no choice but to seek the help of an unlikely character (Nate Parker). Meanwhile, NYPD detective Michael Bryer (Tim Roth) realizes he may have discovered a piece of evidence that could ensure Robert pays for all his sins. "Good movie, nice thriller worth the watch"
"good movie...a movie with a smart script can virtually never fails. Gere is good." "Not too bad and was totally watchable"